After almost 60 years the photo isn’t the clearest, but it offers a fascinating glimpse into the past. Like most, I suspect, who have used the metal bridge at Derry Dam in the Cairngorms, beyond being able to read off the plaque that it was built in 1959, I knew little about it. 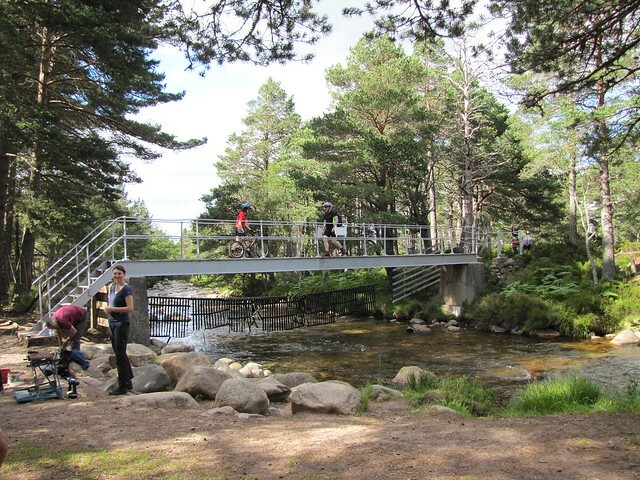 And, until a recent exchange of emails with Malcolm Douglas, the first Nature Conservancy Council warden on the Mar side of the Cairngorms, I never imagined there was a bridge there before it. 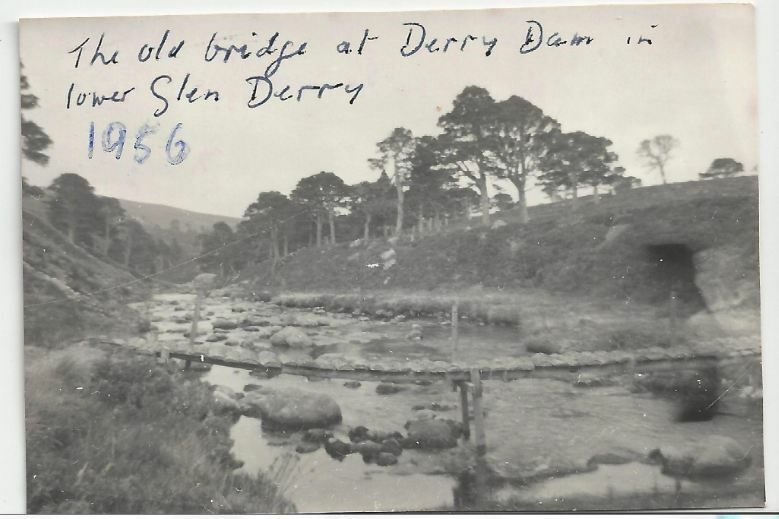 Yet there it is in the photograph above: The old bridge at Derry Dam in lower Glen Derry, and the date added: 1956. The Cairngorms National Nature Reserve was declared in 1954 and soon after two wardens were appointed: Archie MacDonald on the Invernesshire side and Malcolm Douglas on the Aberdeenshire side. 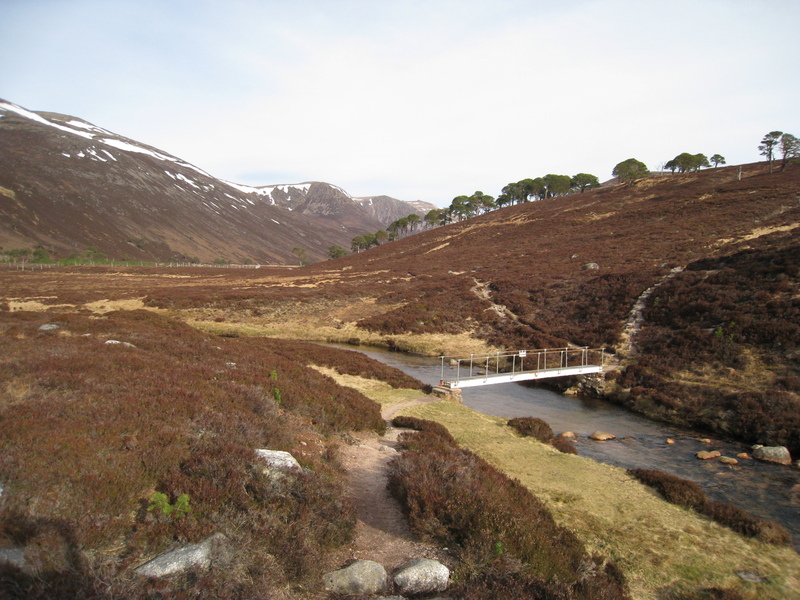 One of the main bridges was over the Luibeg, just below Carn a Mhaim, and I’ve written here of how it was erected by the Cairngorm Club much lower than its present site and washed away in a flood of 1956. The main beams were recovered and Malcolm adds that it was army engineers who resited it in its present location. But there were other bridges needing attention – at Corrour and at Derry Dam – as well as the occasionally unfordable Glas Allt Mor further up Glen Derry. The Glas Allt Mor in full spate. The 1959 bridge was upstream of this point. Derry Dam was much as you see it in the photograph at the head of this post. There was a bridge of sorts at Corrour too. After a drowning accident in 1950, a wire bridge was built the following year. This was described by Syd Scroggie after a visit in 1955 as a telegraph pole driven into each side of the bank with two parallel wires slung between them. The need for replacement seemed quite clear, and the ubiquitous Dr George Taylor, of Cairngorm Club and Aberdeen University designed aluminium bridges for both Corrour and Derry Dam. They were financed by the Nature Conservancy Council and all built in 1959, which must have been an eventful year. Malcolm said: “The Corrour and Derry Dam bridges were built by students. Bob Scott and I helped with the Corrour Bridge. 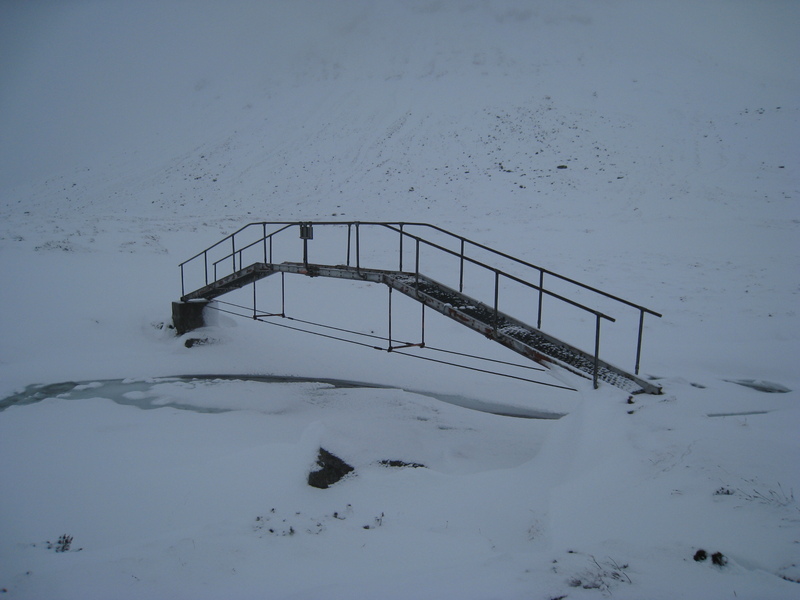 The bridge at Corrour which Malcolm helped to build in 1959 – pictured here in March 2013 with the Dee almost frozen over. The ‘new’ Derry Dam Bridge, est 1959. The photograph is taken looking in the opposite direction to that of the 1956 bridge, but examination of the boulders in the river bed show it to be in almost exactly the same spot. The Coire Etchachan footbridge. 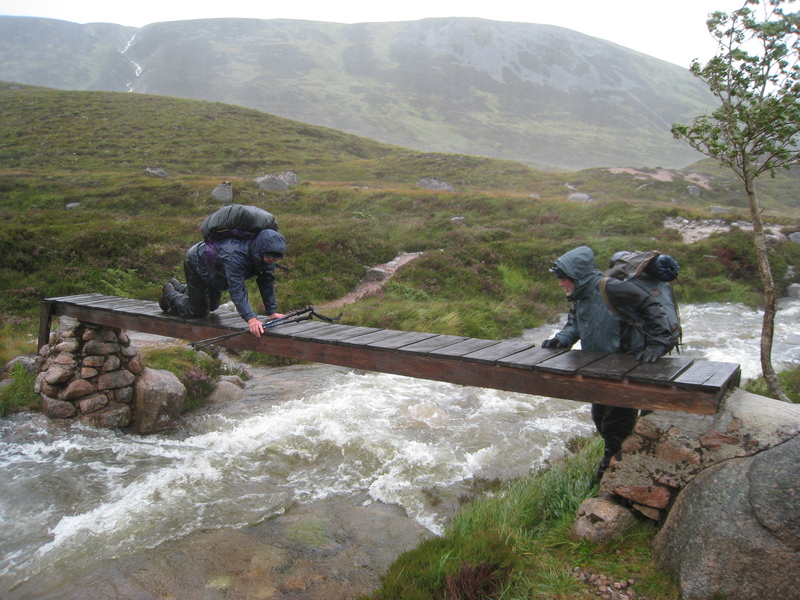 The rather timid approach to crossing is explained by the fact there was a full gale blowing, the planks were slippery and the burn was a torrent. Materials were flown to the various locations by helicopter, an option that had been considered and rejected on cost grounds by the Cairngorm Club for the erection of the Luibeg Bridge just over 10 years previously. About the cost, Malcolm said: “I chuckle a bit remembering that the use of a helicopter that in those early days was considered too expensive. 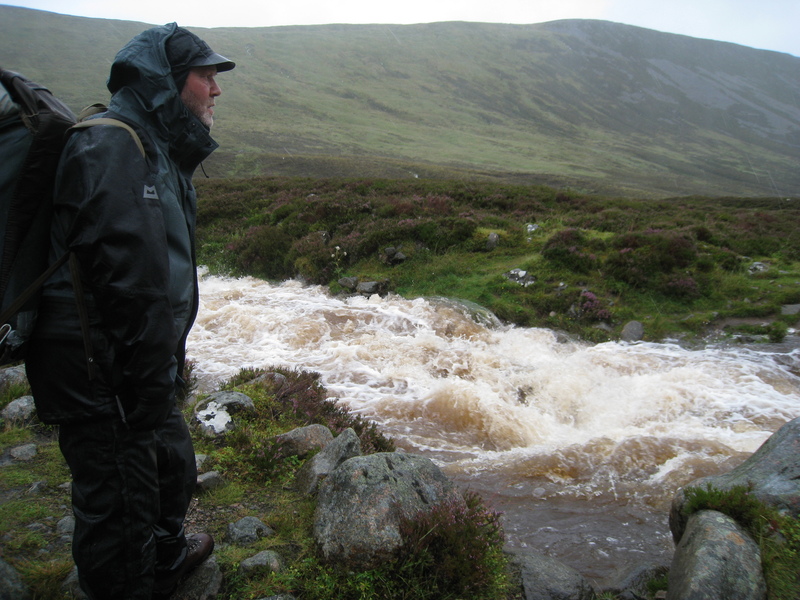 “In fact, using men and horses, the cost and time to transport bridging and fence plot material to sites in lower and higher Glen Derry, Corrour and Glen Geusachan [Another project I’ll refer to in a future blogpost.] was not that far short of the helicopter use cost. I actually have a notion that the Etchachan bridge was replaced about 20 years or so ago but, even so, that’s a considerable legacy from one busy year in 1959, with bridges which have become part of the landscape and seen countless thousands of feet cross rivers in safety. This entry was posted in History, People and tagged Bob Scott, Coire etchachan bridge, Corrour bridge, derry bridge, Derry Dam, glas allt mor, luibeg bridge, Malcolm Douglas. Bookmark the permalink. A very good find neil,extremely interesting. Cheers Jock – a very welcome contribution from Malcolm Douglas. There’s more to come from him too, with photos from his conservation work in the ’50s. Neil, I always learn – be that at your knee or some other low joint. Seriously a joy to read. Cheers Dave. Only passing on what I’ve learned from others. Neil, just come across your blog. Fascinating stuff! I love the Cairngorm bridges. I remember years ago, Nov 1979, I was on a trip with the StAUMC from St Andrews, stayed at Corrour. 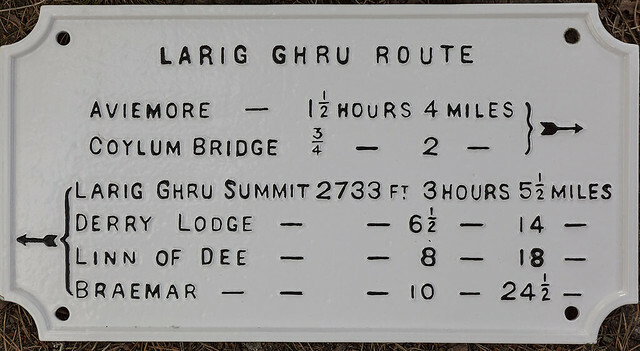 I clearly remember there was a sign nailed to the MR hut at the Derry that said “Glas Allt Mor bridge – gone!” Didnt know until I read your blog that it was in 1970 that it went. When we were young, the path going up Glen Derry was on the west side of the glen as far the Derry Dam bridge. Thinking about it now, and looking at older maps – was this to facilitate the extraction of timber, as the flatter area in the glen ( coming down ) switches from the east to the west at this point ? 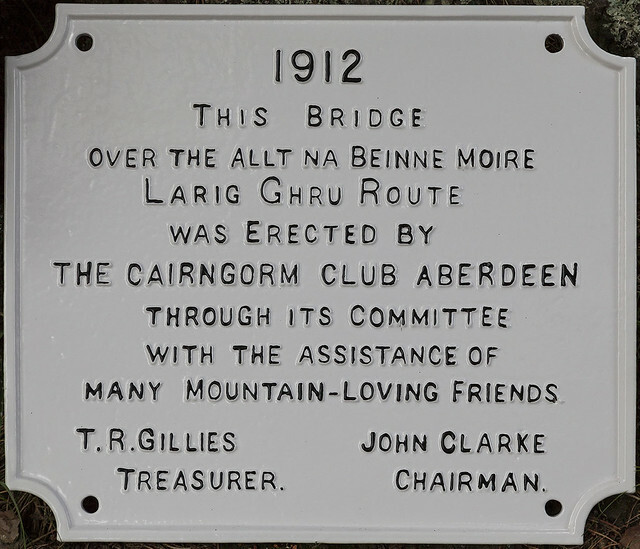 And while remembering the contribution of the Cairngorm Club to bridges, don’t forget the bridge on the Aviemore side at NH 927 078 which celebrated its centenary in 2012 with a good rub down, a repaint, and a refurbishment of the memorial plaques.